Vom 31. März bis zum 5. April 2019 findet im Physikzentrum Bad Honnef eine Sommerschule zum Thema "Physics of Strongly Coupled Systems" statt. Ab sofort können sich Studierende, Doktoranden und Postdocs (ersten zwei Jahre nach der Promotion) hier anmelden. Die Teilnehmer*innen erwartet ein spannendes Programm aus den Gebieten der Staubigen Plasmen, der kolloidalen Systeme und der ultra-kalten Gase. Das besondere an dieser Sommerschule ist, dass die Teilnehmer*innen explizit auffordert sind, sich zusammen mit den Experten auf den drei genannten Gebieten einen Überblick über die Forschung in den jeweils benachbarten Gebieten zu verschaffen, um neue Anregungen für eigene Forschungsprojekte zu bekommen. Die Sommerschule wird federführend von Dietmar Block (IEAP der CAU Kiel) organisiert. Bei Fragen schicken sie bitte eine Email an Prof. Dietmar Block. Dr. 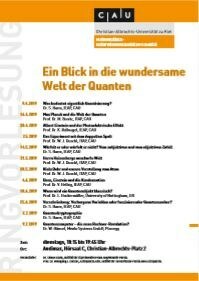 Harm und Prof. Duschl organisieren im Sommersemester 2019 eine Ringvorlesung mit dem Thema "Ein Blick in die wundersame Welt der Quanten". Die Ringvorlesung findet - mit zwei Ausnahmen - immer dienstags um 18:15 Uhr statt und startet am 9. April. For decades, tuning energy barriers has been the main approach to develop information storage bits based on magnetic materials. It is common wisdom that the energy barrier should exceed the thermal energy by a factor of about 50 at room temperature to ensure reliable bit stability. In a study published in Physical Review B (Rapid Comm.) Skyrmion lifetime in ultrathin films Stephan von Malottki, Soumyajyoti Haldar, and Stefan Heinze in collaboration with Pavel Bessarab, who is staying for one year in the Heinze group with an Alexander von Humboldt fellowship, and Anna Delin (KTH Stockholm) reveal that this criterion does not hold for magnetic skyrmions. The attempt frequency - normally assumed to be constant - can change by orders of magnitude with skyrmion diameter and can become the decisive factor for skyrmion stability. This work opens new paths towards stabilizing sub-10 nm skyrmions at room temperature. August 2018: Tobias Dornheim from the Statistical Physics group of Prof. Michael Bonitz (ITAP) wins the U30 Doctoral Scientist Award of the Plasma Physics Division of the Asian-Pacific Physical Society “for the invention of the permutation blocking path integral Monte Carlo method for the ab initio simulation of the warm dense electron gas and constructing the key ingredient in warm dense matter physics”. The award is combined with combined with a talk at the annual meeting of the society, November 12-16 in Kanazawa, Japan. Magnetic skyrmions are localized, stable magnetic whirls which could be used as bits to store information in future memory and logic devices. In a paper recently published in Physical Review B (Rapid Comm.) 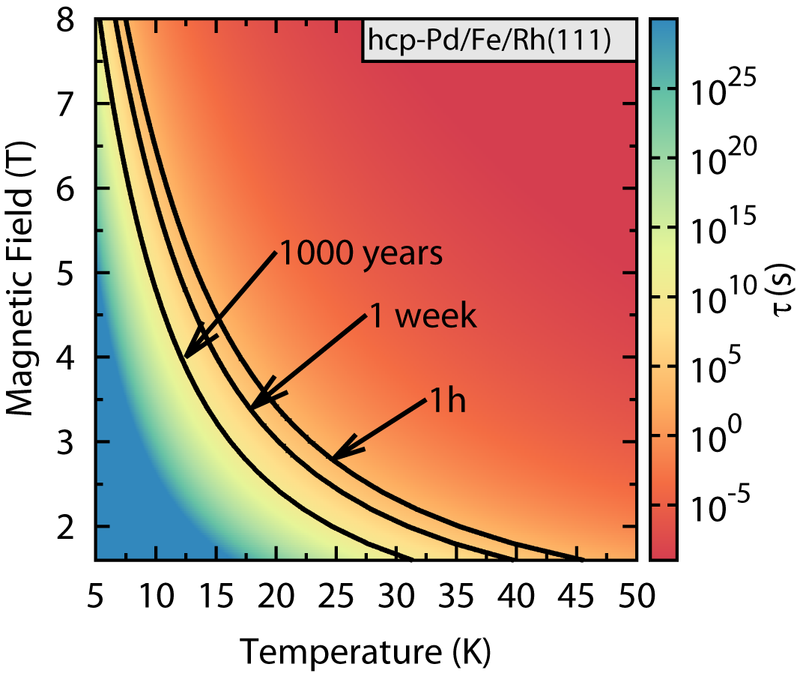 Prediction of sub-10 nm skyrmions in Pd/Fe bilayers on Rh(111) using first-principles calculations it is shown by Soumyajyoti Haldar, Stephan von Malottki, Sebastian Meyer and Stefan Heinze (CAU Kiel) in collaboration with Pavel Bessarab (Univ. of Iceland) that sub-10 nm size skyrmions can form in a new class of materials: 3d/4d transition-metal interfaces. By combining density functional theory and atomistic spin dynamics with the geodesic nudged elastic band method and transition state theory it is demonstrated that the lifetime of skyrmions with radii of 3 – 5 nm is up to an hour at temperatures of up to 40 K – significantly higher than experimentally observed for sub-10 nm skyrmions so far. The applied theoretical approach can guide future experimental efforts to explore skyrmions at novel interfaces. 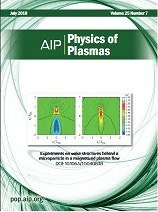 The articles of Oguz Han Asnaz Charging of an irregularly shaped particle in the sheath of an rf plasma" and Hendrik Jung Experiments on wake structures behind a microparticle in a magnetized plasma flow" have been awarded "Featured Article" in the July issue of Physics of Plasmas. Furthermore, the cover page of the July issue features the article of Hendrik Jung presenting experiments and molecular dynamics simulations concerning the wake structure behind a particle in a magnetized flowing plasma. Auf der 45. Konferenz für Plasmaphysik der Europäischen Physikalischen Gesellschaft (EPS) (siehe https://eps2018.eli-beams.eu/en/), die vom 02. bis zum 06. 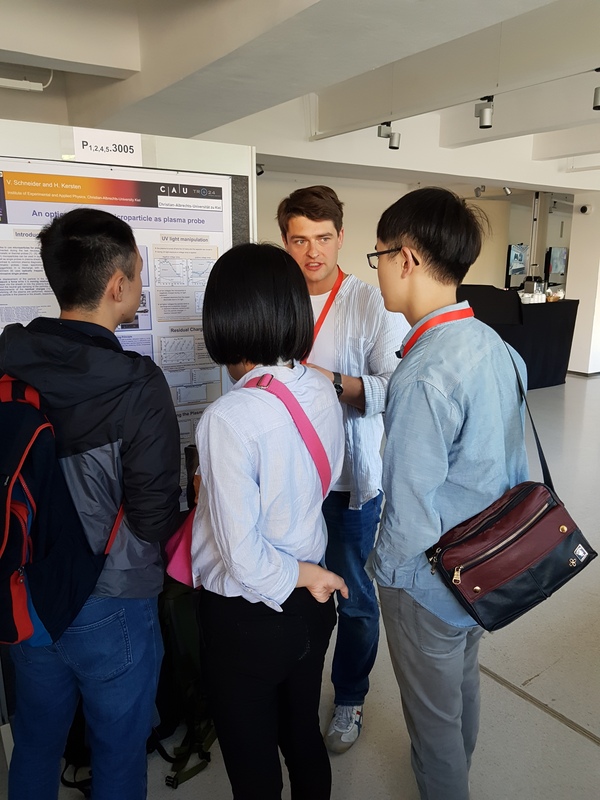 Juli 2018 in Prag stattfand, hat Viktor Schneider aus der AG Plasmatechnologie den EPS/PPCF Posterpreis für seine Arbeit "An optically trapped microparticle as plasma probe" gewonnen. In seinen experimentellen Untersuchungen geht es um die Verwendung von Mikropartikeln als elektrostatische Sonden in der Plasmarandschicht einer Hochfrequenzentladung. Die Testpartikel werden in einer optischen Falle (laser tweezers) eingefangen und im Plasma bzw. in der Randschicht verschoben. Aus der resultierenden Kräftebilanz kann über die Partikelladung der Verlauf des elektrischen Feldes in der Randschicht bestimmt werden. Darüberhinaus hat Herr Schneider die Partikel mittels UV-Strahlung bzw. in einem kleinen Plattenkondensator so manipuliert, dass er deren Restladungen bei ausgeschaltetem Plasma ermitteln konnte. The relais satellite for the Chinese lunar mission Chang'E4 was successfully launched on May 21, 2018. Chang'E4 itself is foreseen to be launched in December this year and then fly to and land on the far side of the Moon. The relais satellite is needed for communication with the lander and its scientific payload. The Extraterrestrial Physics Division developed and built a radiation monitor which is part of the payload and is currently being tested together with the lander in Beijing.